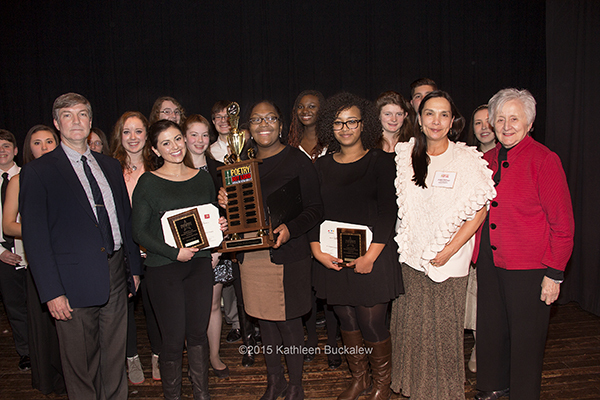 Hannah Sturgis, a sophomore from POLYTECH High School, won Delaware’s Poetry Out Loud state competition on February 24, 2015, held at the Smyrna Opera House. Sturgis’ recitations of “Snake Oil, Snake Bite,” by Dilruba Ahmed; “The Applicant,” by Sylvia Plath; and “Battle-Hymn of the Republic,” by Julia Ward Howe earned her high marks with the judges. The first runner-up was Kate Goorland from Ursuline Academy, and the second runner-up was Eden Negusse from Glasgow High School. For her winning presentation, Hannah Sturgis will receive $200 and an all-expense-paid trip to Washington, DC, with a chaperone to compete for the national championship on April 27-29, 2015. 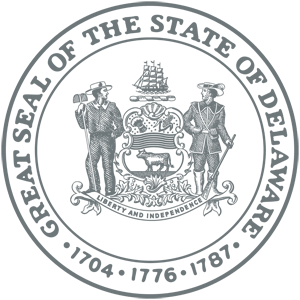 POLYTECH High School will receive a $500 stipend for the purchase of poetry books. Kate Goorland, the first runner-up will receive $100, and $200 goes to Ursuline Academy for the purchase of poetry books. Walmart provided $25 gift cards for all sixteen student finalists and their teachers. 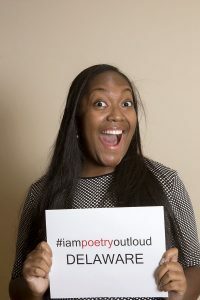 At the National Finals, The Poetry Foundation will be awarding up to $50,000 in scholarships and school stipends, with a $20,000 college scholarship awarded to the Poetry Out Loud National Champion. Front: Delaware Division of the Arts Director Paul Weagraff, Kate Goorland, Hannah Sturgis, Eden Negusse, Delaware Poet Laureate JoAnn Balingit, Delaware State Arts Council Chair Lise Monty. Back: Andrew S.K. Dingwall, Kana Turley, Brianne Gray, Caitlin Mannering, Jessica Pigeon, Shannon Murray, Jake Sheir, Jarinat Sola-Rufai, Hannah Duffy, Frank Thomson, Genevieve Hahn. Not shown: Reanna Virginia Skinner, Gustavo Silveira.